This post is part of the Diversity in Science Blog Carnival on Imposter Syndrome, hosted by Scicurious over at Neurotic Physiology. This may come as a surprise, but your colleagues are probably not thinking this. When I started graduate school at the University of Wisconsin, I felt like an imposter. I thought that all of my fellow grad students were more together, had more basic science training (I never took calculus, intro bio or chemistry as an undergrad), were more articulate, less doubtful. I felt like I’d somehow fooled everyone into thinking I was qualified to get into graduate school, and couldn’t shake the anxiety that someone would ultimately figure out the error. When something good would happen– a grant, or an award– I subconsciously chalked it up to luck, rather than merit. It wasn’t until I was a year or two into my PhD that I learned that these feelings have a name: “imposter syndrome.” Imposter syndrome is incredibly prevalent amongst (though not limited to) graduate students, and has been the subject of research and countless blog posts. I think one of the reasons early grad students in particular feel like imposters is because of the structure of graduate school; the goals are more nebulous, the hoops are fewer and less structured, and the bar is somewhat arbitrary. No one is actually graded on their thesis, and the timelines are often self-directed. It’s difficult to know how much work is enough, when to stop collecting data, when it’s okay to have a hobby or take some time away from the lab. This can lead to two things: 1) guilt, because you never feel like you’re adequate, and 2) a lack of a sense of progress or accomplishment, because the benchmarks in graduate school are much rarer than in undergrad (and the praise, for some, even more so). I was literally finished with the first year of my PhD before it really occurred to me that I had developed a body of knowledge about my field. This may sound ridiculous, especially because by that point I had a Masters degree; obviously on some level I knew that I’d been picking up skills and information for my classes. Still, it took me over three years to consider myself even somewhat knowledgeable in my field. The classic imposter syndrome response to success: self-doubt, anxiety, and surprise. By Depression Comix. Eventually, I stopped feeling like an imposter, and I owe it to two things: feminism and mentoring. For me, learning about feminism and becoming interested in women in STEM opened my eyes to the ways in which my attitudes both resulted from and were reinforced by institutional sexism. A lot has been written about this, so I won’t go into detail, but basically, when I caught myself saying I was “lucky to have good reviewers” when my thesis was published in Science, changing that behavior became a matter of activism. In other words, I realized that fighting imposter syndrome, for me, was in part an issue of equality. This isn’t to say that white upper class males don’t feel self-doubt; rather, it’s easy to imagine how people from underrepresented backgrounds (women, people of color, first-generation grad students, etc.) might be more susceptible to feeling like an imposter, especially if you literally don’t see others like you in your academic surroundings. Saying “I earned this on my own merit and I am awesome!” rather than a surprised “Wow, that was lucky…” when I earned an achievement became a matter of personalizing the political. Mentoring has been a very valuable part of my graduate career for a number of reasons, but it’s also been a large part of the cure for my imposter syndrome. For starters, the very act of mentoring forces you to put on a confident face, and there is some value to faking it until you make it. When my first mentees opened up about their secret fears, I was shocked with how familiar their concerns were. “Everyone feels what you’re going through,” I told them, and I was able to say it with actual, not faked, confidence. In retrospect, it would have been really valuable for me to have had my concerns normalized when I was a young grad student. Now, when I play the role of senior PhD student talking to a fresh new crop of grads, I make a point of telling them that they’re not alone in feeling like an imposter. Another benefit of mentoring is that spending time with my undergraduate mentees made me realize how much I had learned since I’d been a college student, which gets back to my point above about the structure of graduate school making it difficult to see your own development. There’s nothing like someone asking you for advice, feedback, or training to make you realize that you’re capable of providing those things. As a final note, while imposter syndrome can be alienating and the source of unhealthy emotional turmoil, I do think it’s worth drawing a clear line between feeling inadequate and recognizing areas for improvement. Being immobilized by anxiety because you don’t have a background in math is one thing; identifying a gap in your skill set and setting out to work on that is another. This takes time, a lot of self-reflection, and is best done with a good mentor or three. I’ve been very fortunate to have an advisor who makes a point of identifying my strengths, praising my accomplishments, providing constructive criticism and suggesting ways to improve. If you’re not working with someone like that, I urge you to seek out other mentors like a senior grad student, a postdoc in your department, a committee member, or an online community (Twitter is great for this). Likewise, it’s good to have someone who can tell you when you’re being too hard on yourself, because we can’t all be experts at everything. Ultimately, whether you’re a newly-accepted grad student or a tenured faculty member, I think your goal should be to stop thinking of yourself as an imposter, and instead seeing yourself as a scholar with unique strengths, well-deserved accomplishments, and room to grow and improve. I do think luck has something to do with success, but more from the perspective of opportunity. To me, impostor syndrome is more about not feeling like you deserve to be where you are — I don’t think undeserving people tend to get far on luck alone, but a lot of folks probably undersell themselves and their abilities. Perhaps it is the impostor syndrome that actually spurs us on to do better, feeling not only that we can do better, but we have to. If we are perfectly satisfied with how we are doing relative to others, why try to do more? 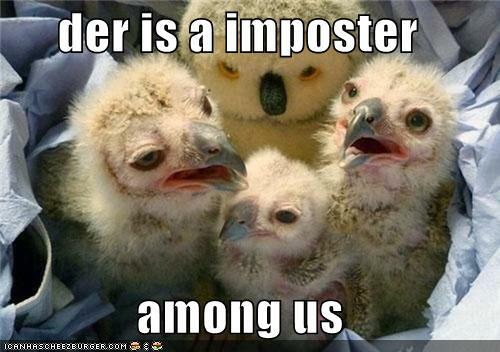 Perhaps it is only those who never experience the impostor syndrome who are the real impostors. Everyone could always do better, after all. Just kidding, maybe. There is some truth in both those connected ideas. Feeling good about yourself while trying to change yourself to do better is one of those ironic balancing tricks we have to master. It’s a bit like walking forward by balancing on the edge between staying upright and falling on your face. Thanks for your comment. I do think it’s important to know when we need to push ourselves to do better, versus when our self-doubt is unwarranted. The trick is knowing which is which. May I speak as someone who has experienced many of these debilitating anxieties? I suspect that personal insecurity, such as we are discussing here, is universal, and fundamental to the human condition. Some people are better than others at masking it, and still others may not be endowed with such discernment and intelligence that they ever allow themselves to be demoralized by their own mistakes. Intelligence is a two-edged sword, and those of us so keenly aware of our own shortcomings are inclined to think that everybody else is aware of them, too. In a way, this is an all-too-intense self-consciousness. Most people are too busy being concerned with their own problems to spend time scrutinizing ours. Maybe the trick is simply not to be so self-absorbed, or to think about ourselves so much. There are people in the world who face far greater, far more elementary problems than we do. Life is too wonderful a gift to waste in a self-imposed climate of fear and anxiety. And in the world of academia, to boot! There is no human community so collectively, exquisitely out of touch as academia. I hasten to add that I hold a doctorate myself, and I love learning, but many whom I have encountered in the world of higher learning are profoundly disconnected from reality. The lesson is, don’t look to them for your validation. Look to those who love you and care about you, and remember that your very life and humanity makes you unique, special, and worthy. This blog seemed like my thoughts were put into words. You don’t feel the same in undergraduate because your grades speak for all the hard work you have put into studying. It is hard being a graduate student when you have few ways for external validation. Thanks for this post. It was really helpful. Hi, Jacquelyn! I’m still an undergraduate and currently a final year student. I think it’s too early for me to say I once had this imposter syndrome since in my case it’d be simply procastinating. But thanks so much for pointing this syndrome out! I’m planning to pursue a PhD in future and yeah, some of my seniors, academic advisors, and young professors (who were just finished their PhD abroad) have told me that pursuing a Master/PhD requires a lot of commitment and consistency. You will be on your own, they said. I’m glad you enjoyed it! A PhD is definitely more independent, but you should pick a program where you’ll have good mentoring, too! Plus, you can find peer mentors — Twitter is great for building a community! I am coming to this discussion fairly late, but I would like to pass along these thoughts. I would suggest that a lot of these feelings are built around new beginnings such as the first day at a new school ( as a kid growing up ), stage fright before a presentation at a symposium ( even if you organized the symposium yourself ), or scared of the public. Many years ago I had to confront these fears because in the space of < 6 months of barely completing 1 of 2 oral presentations in Grade 12, I was out giving Rainforest Walks and Beach Walks for 2 or 200 people at a National Park. Talk about Impostor Syndrome!! For that entire first summer I wasn't able to drive directly to the parking lot. I had to drive past to another area, collect myself and return to the meeting spot. Also I would put out the sandwich board signs 1 minute before my program started, hoping that no one would show up. During the following summer, I did not have to go through this avoidance ritual. For many years I have called the comfort level with a job, hobby or knowledge of a job as: Talking the Talk and Walking the Walk. Perhaps as a Grad Student you feel that you can do neither the Talking let alone the Walking. These days, I describe the Impostor Syndrome as: Punching Above Your Weight ( to use a boxing analogy ). In this way, it gets away from levels of knowledge and feeling inadequate. That line suggests that you have the some skills, knowledge, and training and that you are trying to put them together and operate/succeed at a higher level. In order to combat Impostor feelings: READ, READ, READ and DISCUSS, DISCUSS, DISCUSS the papers, leaders, other researchers, and your Field!!!!!! But as Jacquelyn suggested, all of these elements come together with time. But it is probably best to be proactive and shorten the learning curve if possible. I would also suggest that if all of this were easy, then all of the issues and questions in each field would have been solved long ago by the Big Name Researchers. But it is not easy and that is why it takes new Grad Students and I am sure newly minted PhD's time to get up to speed. That is exactly my state of mind – my way of looking at life has changed quite a bit, but it takes constant work to keep it from slipping. You’re absolutely right – the more I think about this, the more I realize that this post should really be called “How I cured my imposter syndrome– as a grad student.” It’s like a sine wave, I think (and several commenters have pointed this out). I’m in a new position as a postdoc, and I’m having to be very careful not to succumb to the old imposter feelings again! very interesting post, and to some extent, I have suffered from the same problem. However, I had a very different reaction – at some point, the frustration became too much to bear and I started procrastinating (websites, flash games, whatever). I sort of droned along with the stream, performing at 30-40% of my imaginable potential output. Then my supervisor left for a new post, and I got very close to failing miserably. In the end, after about 3 final deadline extensions and a conditional pass, followed by another 2 extensions (those were already with an industry job in parallel) until the final pass. As you say, I have often felt inadequate in more than one way, and had the impression that I faked it to make it. It was not until the very end that I realized I can actually do what is required – and even though at that particular point (yet another badly missed deadline, not sure whether I would not be kicked out definitely) I should have been depressed like hell, this discovery lifted me into a euphoria of which the kind you don’t experience too often in a lifetime (yes, I have the stuff for it!!). In the end, I did it, but in hindsight, so much could have been easier and better if I had known what I discovered only very late down the road! Part of my problem stemmed from the fact that I was convinced that no one else wastes as much time procrastinating as I do (days, weeks, sometimes even a month with barely any tangible output), so I felt I could not really talk to even my fellow co-PhDs and started becoming a loner, too. Once I realized what was going on, this was a very alarming sign for me, and if I discovered this happening again in the future, I would surely seek some form of help much sooner. However, at that stage, I could not know whether it is not simply me being not good enough in one way or another – this occured even a year or two after the regular PhD time at our institute was up!! So yes, I fully agree with you, in that I should have seeked some form of guidance that I could really open up more than to my supervisor (who was a workaholic, and to whom I constantly felt that I needed to project a much more accomplishing image than the naked truth). Very few of the admitted people are really incapable of finishing (the screening is not too bad at most places), it is more a question of keeping it together from all sides – and I think the difficulty of this is really underestimated. Had I learned earlier that the lack of palpable loops to jump could be this detrimental to e.g. feelings of self-worth, then it could have been much easier. Anyway, I wrote way too much already. Thanks for sharing this! This is a fantastic comment – I think you identify a lot of the experiences that folks with imposter syndrome go through, right down to the dreaded procrastination and avoidance. There is such a stigma about talking about these sorts of reactions, especially when they start to manifest as depression and anxiety, and it can be really isolating. Thanks very much for sharing your thoughts. I think a lot of readers will identify. Good post. I am a finance PhD student, and as a white male, I am in the minority. The vast majority of my class mates are from southeast Asia. But the thing that makes me truly in the minority is my relatively poor math back ground. This has made me really feel like an impostor. After two years of fairly severe depression, I have somehow survived. Despite general exams being just around the corner, I am feeling confident and hopeful. This is thanks to three big things (1) a supportive wife, (2) an adviser, who has an amazing ability to shift my thinking when I become too self critical and (3) dealing with some psychological issues by seeking professional help. I now realize that my classmates have their own crosses to bear. While I deal with feelings of inadequacy about math, they deal with similar feelings about their English. I mean, these students are taking a very complex subject in a language they hardly understand. It’s astounding and I tell them so, but their response is always something like “no, my English is very bad.” Moreover, most of them are amazingly productive when working for a professor, but seem to lack that entrepreneurial spirit, which allows one to fight hard to develop and sell one’s own ideas. This is certainly a blessing I received from being an American and son of a small business owner. The point is, as Jacquelyn says, that nearly everyone suffers from some degree of impostor syndrome. And, even though I always felt I was the biggest impostor, it looks like I will likely go on the job market before my two Chinese class mates. This despite their math and statistical skills far exceeding my own, with one being truly a math genius. Life is funny that way. Fake it till you make it. Thanks to a friend who forwarded this to me! Now i know what it is and surprisingly, i am not alone! This thing is like a sinusoidal wave! Thanks Jacquelyn, never thought from this angle. It gives the much needed confidence to work on the problem than hide in a cave. Looks like this syndrome cut’s across cultures and continents. I never had a mentor in my life, may be there lies my problem. It’s complex, but hey thanks, i can alteast now experiment with different solutions. I’m glad you found it helpful! Not having a mentor is tough, but one thing you can do is to join in any relevant groups– especially for students– that you might have access to. I.e., the Ecological Society of America has a couple of list-servs, both general and for students, and those are often good places to network and ask for advice (you can always send the list director an anonymous inquiry, too). Thank you so much for this post! I’m two weeks into my PhD and find myself very shaken by the environment. I went into the workforce for a few years after my undergrad, and shifting back into academia has been terrifying. Looking around at my peers and mentors has given me exactly the sense you describe of being an impostor among geniuses. My very kind advisor certainly helps though. When I ask for a meeting, he always responds with ‘delighted!’ and seems genuinely interested in my comfort and progress. I’m glad you found it helpful! Having a supportive and invested advisor is a huge help. One thing I’ve learned is that building a diverse network is good, too– with senior students, other faculty, and even your peers. Best of luck! It’s all too easy to succumb to Imposter Syndrome as a PhD student. This excellent post discusses why, and what can be done about it. Thank you for having the courage to speak openly about this. I was prompted to look up this topic in response to my own feelings over some recent shortcomings and flaws in public performance. I first heard the term “imposter syndrome” from a talented friend and colleague who was confronted with this problem even though, in my judgment, she was eminently qualified at what she did professionally. At any rate, I am probably further downstream in life than you, and I don’t know whether I have this “syndrome,” although I chronically experience many of the same symptoms: perfectionism, an almost debilitating fear of failure and public humiliation, acute self-doubt and a fear of worthlessness. I don’t fear being “found out,” so much as I feel constantly subject to judgment and disapproval. I have plenty of accomplishments to attest to the contrary, but every screw-up nonetheless prompts a renewed plunge into this sense of worthlessness. I wonder if “imposter syndrome” is a manifestation of an “inferiority complex.” Anyway, the solutions you propose seem valid and constructive, but what is hardest to do is to break some old, ingrained habits of thinking. It is fairly obvious that it is I who judges myself so severely, but apparent as that is, it is hard to stop. It goes away when I experience some success, but life is a roller coaster, and sooner or later, we come back to less-than-stellar moments. Thank goodness I have a schedule to keep; sometimes that’s the only think motivating me to keep going. It is at least reassuring to know that other people experience this, too. But what I wouldn’t give for a little genuine hubris! Stephen, thank you for this comment! I’m glad you found the post useful. I think you’ve really characterized what are a lot of underlying fears and anxieties that many of us in academia or other high-stakes professions struggle with. You’re absolutely right that changing your thinking is an important part of this process. For me, mindfulness has been really useful. I still feel these emotions, but if I am mindful of them I can identify when the anxiety/inadequacy loop starts, and use some tricks I’ve learned to get off of it (like positive self-talk, where you tell yourself something that is 1) true, and 2) positive about yourself). For me, just knowing other people were going through what I went through was so incredibly helpful! Best of luck as you grapple with your own feelings of self-doubt. All graduate students should read this article. Dear Jacquelyn, I enjoyed your article very much. Being in that catagory of “white, …..”, well at least middle class male, I can tell you that we all feel the imposter syndrome. I also attended UW-Madison, doing a Ph.D. in Agricultural Engineering. Your article helped remind me of how I can help my current undergraduate and graduate students at the University of Puerto Rico who are no doubt experiencing much of what you described. My wife, who happens to be bi-racial, experienced a profound shock when doing her Ph.D. at UW-Madison in the Plant Breeding and Genetics Department. So much so that she wrote a novel about it (The Harvest of Reason; also see The Paridigm Shifter – Science in the Hands of Women ). For any of your readers who may be interested in the topic of science and women, they may want to visit her website at http://rheaharmsen.com . Thanks for this comment! I definitely think there are lots of reasons why any person (and not just in an underrepresented group!) might feel like imposters, but in order to combat it I think it’s useful to look at the underlying causes that might be important for each given person. Thank you so much for sharing those resources– I’ll definitely be checking out your wife’s book and website! I like your post – though personally I doubt that imposter syndrome is ever cured. Instead, it think it goes into remission for a while before popping up in another form. I like that you have been consciously rephrasing things to take credit for your well-earned accomplishments. That’s something that I’ve been working on to. It helps a lot! That’s a fair point – certainly, at this stage I don’t feel like an imposter in grad school, but who knows what will happen when I start my postdoc! Maybe “cure” isn’t the right word so much as treatment– it’s an ongoing thing, and the tools will hopefully keep me from slipping. Great post. I’m will insist everyone in my group reads it. Many thanks! 2) Talking candidly about this with trusted colleagues can be beneficial. Thanks for the kind words! I’m glad you found the post helpful. That’s awesome news about you starting your PhD, by the way– congratulations! You are very fortunate to have found a mentor. I firmly believe that they can do untold good to our esteem and our careers. A good one is so hard to find, however, particularly for women in STEM. I agree – I know so many people who have had really poor graduate experiences that come down to a lack of a mentor. I can’t overstate enough that if you feel like you’re not getting good mentoring from your advisor, actively seek it out from someone else. How funny! I wonder what the minimum grade for a “Pass” is in those cases. I’m glad you enjoyed the post!